Ever been in a situation, where you are constantly opening Google search and then searching for a word which you don’t know the meaning for? Or much worse, you are learning a new language and you do not know how a specific word is pronounced? Are you a kind of a person who frequently uses a set of words like sending your address or posting your email and frustrated much to type it again and again? Well, I have got a solution for all of your problems and it is not the keyboard app with an inbuilt search engine I reviewed before. Get ready to change your awful experiences into awesome, FOREVER. 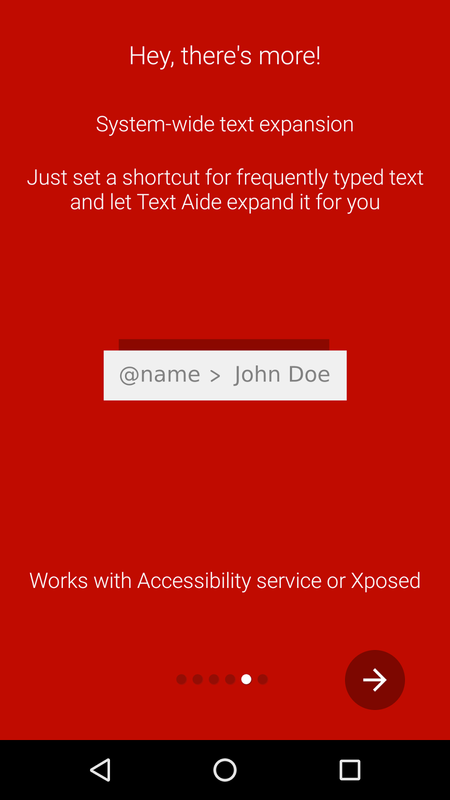 I Should say that Text Aide is a productivity powerhouse because it does so much useful things for you that your time is saved significantly and your overall user experience is improved. The app allows you to search the meanings of words, find out their definition, search for them in your favorite search engine and also reduce the number of words you type by substituting it with a macro of your choice! Once you have setup the app you can use it from any screen you are in. Be it an eBook you are reading or a web page you visit. It even works when you are having a conversation with someone. And the highlighting feature is that you don’t need to open the app every time because you can access it either from the notification panel or a floating button from any app you are using. What I like the most about this app is that the simplicity involved in setting up and getting it to work. You need not mess with the settings or configurations because everything has been tuned to provide the best possible experience by default. Of course, you can tweak with the settings menu and change the configuration to your own preference like setting up the default search engine to your favorite or increasing the size of the font. Also, by using the expansion feature you can add your own macro so that whenever you want to type a large piece of information you can use this short macro as a substitution and the app will automatically replace it with the text you have setup. For example, if you are a business associate and constantly in the need to send your office address to many people then you can create a macro named “@office”. So, the next time you use it in a message, it will be automatically replaced to your office address. Yes, it is pretty cool and you can set up as many macros as you need. For using the search, define and speak feature you just need to select the text for which you want to perform the operation and then a drop down menu provides you with the options from which you can select one. You need not leave your current app as the results are displayed in a floating window right where you are. There are numerous scenarios when this app proves to be useful. Be it when you want to know what a word means in an email but you do not want to leave the app, just select the word and click define or search and your result will be right there, floating. It is also useful for people who are learning a new language and have not yet used to some of the words, just select that word and click pronounce and it will be dictated for you immediately. Also, as I said above, the macros are much helpful for people frequently typing and sending the same repetitive long messages. The app goes very lightly on your phone and unless you want to keep the copy aide service on the notification bar, you will not even notice a slight decrease in your battery or your device performance. So, even if you have a low end or a poorly configured device you can use this app with no issues. The need to download and install an additional dictionary for the purpose of clearer definitions is the only downside to this app, but if you are ok with using the default google dictionary or the wikitionary you could not find any issues with the app. In the plays store, the app has got an enormous rating of 4.7 along with 10 thousand downloads which are not surprising considering how useful the app is. Download this app right now and change the way you have interacted with your phone forever. Comment and share if you love the app and also check out my other reviews! Like my facebook page on the left for more updates! Previous articleThese Are The Best Apps of 2016 According To GOOGLE! Next articleGoogle’s New Messenger App is The iMessage Alternative For Android!